New Zealand is one of the best places in the world to escape to for a romantic getaway. With dramatic coastlines, awesome snowcapped mountains and beautiful fjords, NZ is the perfect location for love. Whether you are planning a honeymoon or a romantic getaway, the land of the long white cloud should be at the top of your list. One piece of advice though, in the heady rush of love, don’t forget Air New Zealand Travel insurance. Money can’t buy you love, but it is needed to buy travel insurance to ensure your flights and holiday are covered. Join us as we take a tour to some of the destinations that provide the best romantic experiences in New Zealand. The Coromandel Peninsula is blessed with over 400 km of pristine white beach, centuries-old rainforest, and native wildlife, providing the perfect combination of beauty and relaxation. There are lots of fun activities you can do when you visit the Peninsula, such as kayaking, stand-up paddle boarding, and swimming. If you prefer a more laid-back experience, you can spend some relaxing hours in the spa-like environment of Hot Water Beach, or enjoy the walk from one end of Hahei Beach to Cathedral Cove. Cathedral Cove is actually one of the most picturesque parts of the Peninsula, and a magnet for visitors and sightseers. For more information about the Coromandel visit Coromandel Adventures. In 2016, Waiheke Island was named one of the world’s top 10 places to visit by Lonely Planet. This idyllic island is only a 30-minute ferry ride from downtown Auckland and provides a relaxing atmosphere that is quintessentially romantic. Renowned for its wine, a visit to Waiheke Island is incomplete without a tour of some of the vineyards the island is famous for. If wine is not your thing, there are hundreds other fun activities to engage in on Waiheke Island, including kayaking, exploring the wartime tunnels or picnicking in one of the many coves that surround the island. If you or your significant other is an art lover, there are scores of local galleries and art studios to spend some time in. You can also visit the delightful Ostend market for a Saturday morning of shopping fun, tasty local delicacies and beautiful keepsakes. Are you looking for a romantic destination that provides a combination of wine and adventure? Then you need to spend some time in the Marlborough Sounds. The Sounds are a complex network of river valleys, scenic routes and tranquil trails. This dramatic destination has the most sunshine in the country, as well as abundant wildlife that will appeal to nature lovers. No visit to Marlborough Sounds is complete without a bottle of wine or two. Marlborough is home to the world’s renowned sauvignon blanc, one of the most popular wines in the world. If you feel the need for a more active adventure, then take a boat down to Queen Charlotte Sound and spend a few hours- or days- on the Queen Charlotte Track. You can also visit Abel Tasman National Park for a day of swimming, kayaking or simple beachside relaxation. You can visit the Marlborough Sounds Adventure Company to find out more. For many years, Lake Tekapo has been one of the favored destinations for couples looking for a romantic holiday. 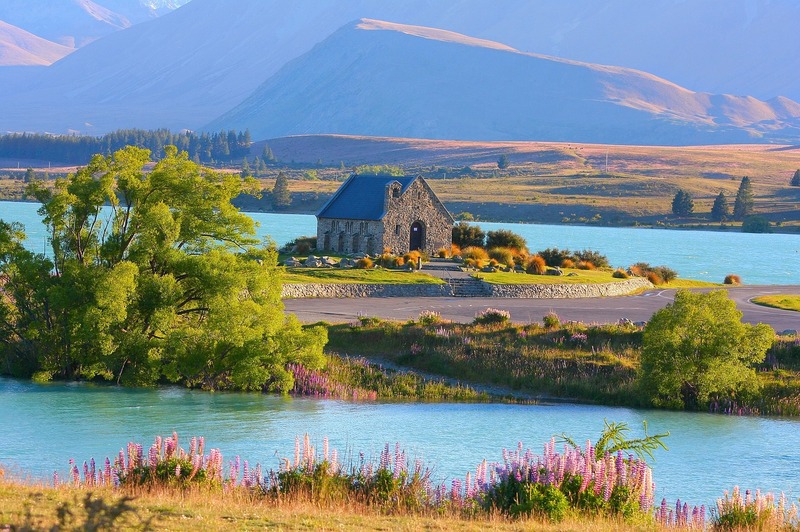 The iconic Church of the Good Shepherd, set against the picture-perfect waters of the Tekapo Lake, has played host to a number of beautiful weddings. Part of the allure of Tekapo is the Tekapo hot pools, where you can have a luxurious relaxing soak and enjoy the therapeutic effects of the spa. You can even spend an evening beneath the stars at the Mt John Observatory, one of the largest dark sky reserves in the world. While you are at Tekapo, don’t miss a trip to Mount Cook National Park, where you can view the tallest mountain in NZ, glacier lakes and keep an eye out for the cheeky Kea, NZ’s native parrot. French is the language of love. This means that Akaroa, an hour away from the hustle and bustle of Christchurch, is the closest thing to France in New Zealand. History has it that a shipload of French settlers arrived at Akaroa only six days after the Union Jack was hoisted. But, even though the French were too late to claim the region, the settlers stayed and their influence remains. Akaroa is renowned for the colonial French architecture and quaint street names that remain till today. When you visit Akaroa for your romantic getaway, you can almost pretend you are having a romantic affair in a French town. After strolling through this picturesque town, make sure you find time to go on a cruise and go swimming with the dolphins. There are plenty of romantic experiences in New Zealand, making it the perfect destination for your next getaway!